The Rheumatology team is made up of a Physician and a Physician Assistant with specialized Rheumatology training. Striving to stay abreast of the latest advances in medical management of Rheumatological and Auto-Immune disorders, the team goal is to limit and control the destruction of joints and immune system dysfunction while enhancing patient quality of life. Rheumatology is the study of joints and the muscles, ligaments, and fibrous tissue surrounding joints; it is also an arthritic condition marked by inflammation and pain in the joints. Perhaps the most common condition treated by Kymera Rheumatologists is rheumatoid arthritis (formerly known as rheumatism). At one time, it was not uncommon to hear people speak of having rheumatism when in fact they had osteoarthritis or even gout. However, although rheumatism is a form of arthritis, it is not the only form. Other forms of arthritis include gout, ankylosing spondylitis, and osteoarthritis (OA). In fact, there are over 100 different types of arthritis, some of which often get confused with rheumatoid because often a Rheumatologist helps manage these as well. Rheumatoid arthritis (RA) and osteoarthritis manifest similarly in that both involve inflammation and joint pain. 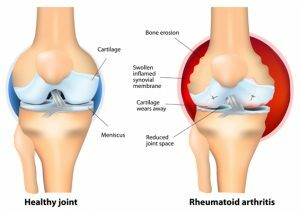 The key difference between the RA and OA is that osteoarthritis involves the loss of cartilage between joints in the body and rheumatoid arthritis is an autoimmune disorder in which the immune system attacks joints. 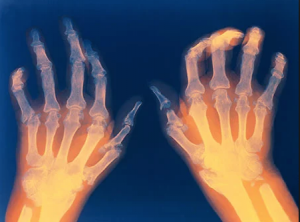 What is the Main Cause of Rheumatoid Arthritis? Rheumatoid arthritis is caused largely by the immune system fighting where it need not fight. It is a condition marked by the attack of healthy tissue without cause. What triggers this reaction is not yet known. The immune system is supposed to create antibodies which attack viruses and bacteria in the body to fight infections. In RA, the body attacks healthy tissues surrounding joints which normally produce lubrication become inflamed. The inflammation restricts lubrication and the inflammation worsens while at the same time the lack of lubrication causes damage to cartilage and bone. In turn, this causes more inflammation as the body attempts to protect and repair itself, which in turn causes more damage. What are the First Signs of Rheumatoid Arthritis (RA)? 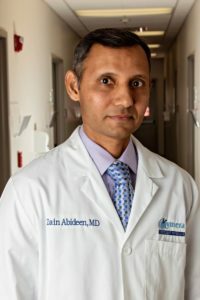 Does a Rheumatologist Treat Autoimmune Disorders? Yes. Although he or she may consult with another internalist such as an Endocrinologist (in the case of Lupus), autoimmune disorders are best handled by your Kymera Rheumatologist. This is because most autoimmune disorders commonly cause inflammation, which is best handled in the rheumatology department. What Sort of Tests do Rheumatologists Perform? Your Kymera Rheumatologist will conduct a series of tests to determine what condition is causing the inflammation, pain, and discomfort. One of these may include checking CRP (C-Reactive Protein) levels. High C-Reactive Protein levels indicate inflammation and is a starting point. Many specialists check the CRP levels because inflammation can occur in the arteries or result from a range of conditions, including cancer. Are There Any Foods I Should Avoid if I have RA? Refined Sugar and Flour – Refined sugar and refined flour both contain simple carbohydrates, which metabolize quickly. This will drive up blood sugar levels which causes the body to produce cytokines. Cytokines are pro-inflammation chemicals, which can worsen symptoms. Too, these foods can cause weight to increase, which places added stress on joints. Red meat – We have all heard of the benefits of Omega-6 fatty acids of which red meat is abundant. What few have heard is that Omega-6 fatty acids can also contribute to inflammation when intake is high. Lean cuts and moderation are recommended. Fried foods – A 2009 report in the Journal of Clinical Endocrinology and Metabolism drew attention to the effect fried foods have on the human body. It showed that these foods create toxin which can increase oxidation in the body and subsequently, additional inflammation. Gluten – Gluten is a specialized protein found in grains like wheat or rye. Although not fully understood, evidence indicates that gluten can increase inflammation in some people, especially those with RA. Alcohol – Long-believed to be associated with increased inflammation in patients with RA, recent studies indicate there is a balance to be found. Researchers have learned that moderate use of alcohol can be beneficial to patients suffering from Rheumatoid Arthritis but beyond a few glasses per week, the effects are reversed and the condition worsens. Exercise care when consuming alcohol. Processed foods – Anything that is ready-to-eat with no cooking needed is said to be processed. Such foods contain high levels of refined sugar and four along with saturated fats. As already described above, these three are very detrimental to patients suffering from Rheumatoid arthritis. Pay attention to what is put into processed foods. Because inflammation can occur system-wide and joints are present throughout the human body, the Rheumatologist treats a range of conditions from mild to severe. One key goal of a rheumatologist is to reduce swelling, which in turn reduces the associated joint pain. The medications and treatments chosen will depend largely on the condition to be treated. At Kymera Independent Physicians, we pride ourselves on advanced, compassionate care and treatments. We hope we have been able to answer many of your questions about Rheumatology in general. If you are a patient or considering becoming a patient know that we are happy to answer all your questions to your satisfaction. We know that RA and related conditions are most uncomfortable and finding relief may seem daunting. But you should also know that we are here for you. For more than two decades, we have been helping patients from all walks of life manage Rheumatoid Arthritis and various auto-immune disorders. We can help you too. With convenient treatment center locations Kymera delivers a better healthcare experience. Get in touch today using the numbers listed below if you suspect RA or a similar condition. The sooner you know, the better the outcome.